Medusa: BOMBING AT KIMKINS !!! 'I realized Kimmer was not really coming clean as I had hoped she would. Things really were not changing after all. And her photos on the front page... I had recruited Brian and Heather to be out there with her losing weight. I began to notice that Heather was losing a lot of weight pretty quickly and Kimmer claimed about the same loss. But suddenly Kimmer looked 100lbs less than Heather and I knew something wasn't right. It was really the final straw for me. I have asked Kimmer numerous times what Kimkins plan she was following and never received a reply. This, combined with the rest was too much for me and I decided to take a break and reflect on the situation." Aren't you wondering why the boards are so quiet? Why one after another, Admins keep leaving? FitnessGuru, gone. "Dr." Mark, gone. TippyToes, out the door. 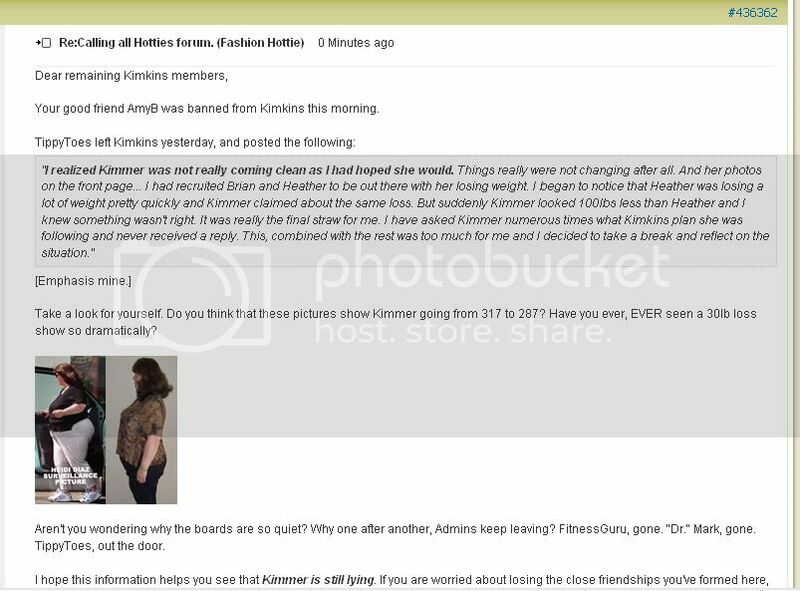 I hope this information helps you see that Kimmer is still lying. If you are worried about losing the close friendships you've formed here, don't be. There are friendly and peaceful messageboards set up to welcome ex-Kimkins people, which focus not on the negativity but on losing weight with great community support. Many, many of those who've been banned or left Kimkins are now posting there. You'll see old friendly faces again. My advice is to save the journals you have here, because Kimmer told TippyToes that this site is in danger of going down. You don't want to wake up one morning and simply not be able to log in. Get out while you can, before this site falls apart completely. For new people to whom this is all a mystery, Google "Kimkins scam" to see what this site's founder is really like. Don't get sucked in. And to Kimmer - shame on you." Thanks, ADuckyMole, for your post on LCF yesterday and the screen shot you took of the bombing at Kimkins. Well done. And my thanks, as well, to the poster who bombed Kimkins. Great work! hehe they forgot to link to the latest KTLA video!